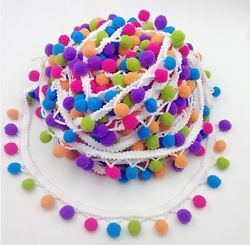 We are a leading Manufacturer of pom pom lace and multi colour pom pom lace from Tiruppur, India. Our pom pom are manufactured by making use of supreme quality required basic material, procured from the accredited vendors of the industry.Keeping in mind the latest fashionable requirements of our esteemed clients, we are manufacturing and supplying an alluring range of Pom Pom¿¿Lace. Our offered lace has become the first choice of our valued clients as it is designed with current fashion trend that have gain the attention of everyone. The provided lace is highly appreciated by our valuable clients for its glossy finish and mesmerizing pattern. 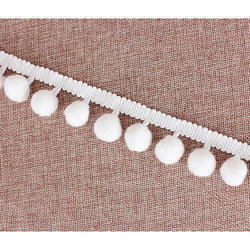 Our pom pom are manufactured by making use of supreme quality required basic material, procured from the accredited vendors of the industry.Keeping in mind the latest fashionable requirements of our esteemed clients, we are manufacturing and supplying an alluring range of Pom Pom Lace. Our offered lace has become the first choice of our valued clients as it is designed with current fashion trend that have gain the attention of everyone. The provided lace is highly appreciated by our valuable clients for its glossy finish and mesmerizing pattern.